So, in Journalism 101 we learn that the world is going digital, mobile, wicked-crazy, and fast-paced. Videos are what's in, and we want LOTS OF PICTURES, oh yes. 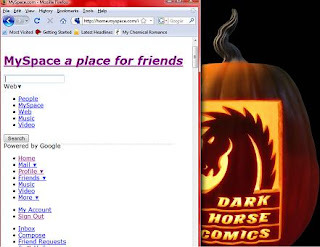 Make those sites fancy, too, would ya? Well, that's all fine when you are a student and connected to the University's hi-speed, wireless internet, but not so great when you return to your dial-up at home. I was spellbound somehow while sitting in Journalism class and hearing about the scary advances in media, and how sales in newspapers are declining and many simply turn to the internet for their news, and it can't be news unless you know it the second it happens. Not only do those things serve as perfect ingredients for hasty, rotten reporting, but they're also not true for me in the least when I return home and wait 20 minutes to check one lousy e-mail. I'll get my news when I can, thank you-- and you can FORGET about my watching even a one minute video. In my previous post, I discussed excitement for the start of the second series of my favorite comic The Umbrella Academy. Today, I made the usual thirty mile drive (yes, thirty) to my favorite comic shop to pick up the first issue of the Dallas series, titled The Jungle, and let me tell you that I can already see my future's being filled with month-to-month obsessing over the next issue's release. The New MCR Site : Communication at its Creepiest. I'm just going to throw this out there: Twitter is kinda creepy: Advanced internet stalkery that can be automatically updated via cell phone from anywhere to tell your "followers" exactly what you are doing at that very second. Yea, it's creepy. I just received a text message letting me know that the drummer of my favorite band's dog was hungry and from the singer telling the band members to update via this creepy Twitter. Earlier, I watched -- through my text messages -- their conversation as the drummer drove to the singer's house and asked him if he wanted anything from Coffee Bean (he did- an iced white chocolate mocha). I feel like a creeper. But I'm not alone. My Chemical Romance's "Three Cheers for Sweet Revenge" on VINYL! Four years have passed since "Three Cheers for Sweet Revenge" My Chemical Romance's first major label CD was released on Warner-Reprise records. It is noted for being the album that really brought My Chem to the forefront of music with their first major-label-released single, "I'm Not Okay (I Promise)" followed by the widely popular "Helena" and "The Ghost of You". To celebrate the album's great success, the band is re-releasing it on special-edition red vinyl and adding a handwritten lyric sheet, artwork that did not make it to the CD, and even a fancy-pants gun stencil! Here it is, folks-- the end of my first quarter ever as a college student. My exams are done, bags finally packed, and I will be heading home later this morning (I'm writing this at 2:30 AM) for six, long weeks to think about what I have done. Actually, I say that as if I have been corrupted, but -alas- I have not; try again next quarter, you fiends. 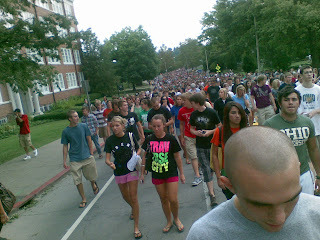 Cassie's Fall Quarter Photo Round-Up! I like to "introduce a little anarchy..." to chalkboards. "Kill the Batman," but spare the squirrel, please? Someone proposed marriage to me on the graffiti wall. I love you, too. Welcome to my fifth and final installment in my Bill and Trav blog series. In several of my blogs, I have expressed what drives me to want to work within the music industry, and this show helped me discover even more reasons why. this feels a whole hell of a lot like home. Being able to see the crowd from where I stood was one of the best parts of the show. All the people in that audience were there for the same reason-- in the moments of their favorite songs, they were one. We were all united through music. I. love. fans, and I want us all to be united as we are during those moments at the shows, or when we've been standing in line outside in the snow together for 12 hours, or when we turn to complete strangers in the audience while singing along to our favorite lyrics and feel as if that person is our best friend of several years. Welcome to Bill and Trav's Bogus Journey Tourblog part the third. In this episode, I will discuss something I find very, VERY essential to a good band's performance and something which I witnessed at the show I attended on "Bill and Trav's Bogus Journey Tour" featuring The Academy Is... and We the Kings. If you are in an aspiring band or even a prominent band, listen the hell up, because I -as a fan- have some advice for you. In my experience in the front rows of multitudes of crowds, nothing quite sends a jolt of excitement through me as when a band member points out the fans who are singing along ferociously-- when a band shows an active appreciation for its supporters. Now, it doesn't have to be me, but any fan. We all feel exstatic for that person, you can feel the surge in the crowd move in his or her direction, and feel our collective excitement grow when you acknowledge us. 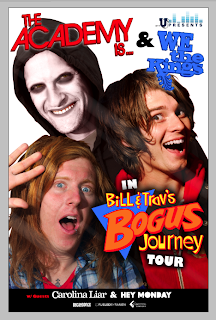 Welcome to Part II of my "Bill and Trav's Bogus Journey Tour" blogs. Here, I shall review the show in full for you guys, and more blogs will be coming your way soon where I will examine various other topics aroused in my mind from the show. So, the morning of November 2nd, I woke at my friend's house without grogginess, for; my excitement had grown in the few hours I slept and replaced any sleepiness that would have normally been there. The plan was for our friend to meet us at my place of slumber for the the night between 11:30 and 12:00, and so it happened. For me, arriving at a show later than 11:30 AM is generally something completely insane (I'm a 4 AM girl, myself), but we were just going to chill and hang back for this one. After much trial and error in securing my ride to the show and back to OU, I finally got it all together and had a wonderful weekend that concluded in a wonderful show. Since this is my journalism blog, I figured I'd turn this show into a series of blogs, each of which will contain a different story I saw that was write-worthy during the show. This, my readers, is your classic introductory blog, and I have much to tell you from this single show within my next -at the very least- four blogs. Expect a review, pictures, a video that nearly wasn't, a heartfelt epiphany on my part, and a few words on crowd-interaction. Part II will be the review, so keep your eyes open for the second installment in Cassie's take on "Bill and Trav's Bogus Journey." I am not going to pretend that I am a political person, but the up-coming election was the focus of our J101 class on Thursday, and we spoke of social media and how the candidates have utilized it on their own, but I have something to show you guys that is also bringing politics into the social media spotlight. Note that I have circled one of my particular friends. Now, can any of you guys tell me what you would imagine I am and what you would imagine "Heavens" is from this picture? "No:" that's my answer to your thoughts. I'm not an obsessive Obama-supporter who feels the need to tell the world this, and no, "HEAVENS" is not a political group. Heavens is a two-piece band, and those two guys are brilliant Obama promoters. Boom! 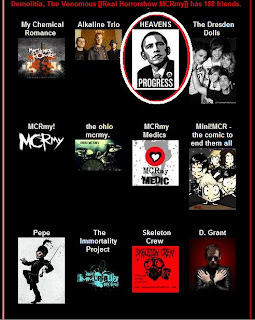 Suddenly, every person's myspace page with this band on their "top friends" became an ad for Barack Obama. Think about that, oh you strategists.